Croaghanmoira North Top is the 348th highest place in Ireland. Croaghanmoira North Top is an easy summit to reach as it is close to the road which runs south from Glenmalure, and has a good track most of the way up. It will most likely be combined with Croaghanmoira for a compact walk, or extended along the Fananierin ridge (A spur running north from Croaghanmoira North Top) to take in Fananierin also. There is parking for a few cars at a Coillte forestry entrance at T08752 87601 A. From the car cross the gate and pause to read the interesting notice board that explains that walkers are allowed to walk here if they keep to the track, and that shooting occurs occasionally to control rodents and other ‘wildlife’ management. The track crosses the heathery shoulder of Croaghanmoira North Top, which is really just a few minutes up the slope to your left. Follow the track as it climbs gently for about a kilometre to the col between the North Top and the main Croaghanmoira summit. Now either continue to follow the main track alongside the forestry to aim for Croaghanmoira and Ballinacor, or else turn left (north) to quickly reach the summit of Croaghanmoira North Top. 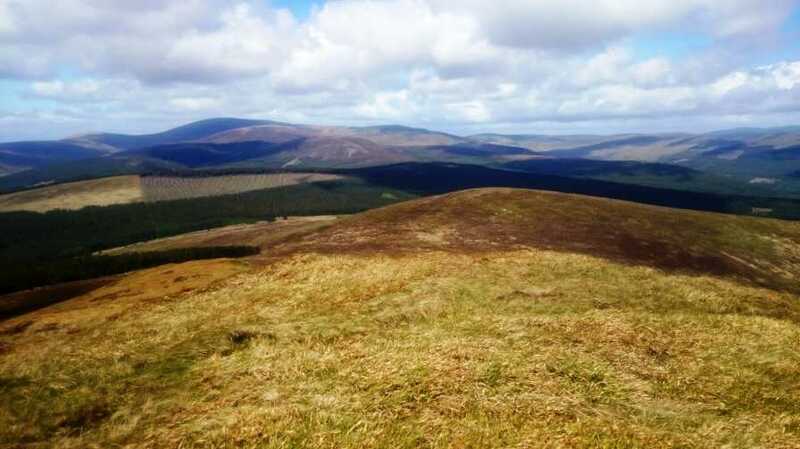 This is an unremarkable typical Wicklow heathery hump in itself, with no cairn or other summit marker, but it has wonderful views to the west and north. This summit is all contained in the Ballinacor Estate, and the requests in the sign at the start of the walk should be respected to ensure ongoing access for walkers. However the proliferation of quad bike scars on the Fananierin ridge and the slopes of Ballinacor indicate that this is a problem and that these other upland users don’t pay any attention to requests.